^ a b "Seinfeld". BBC. Archived from the original on April 27, 2006. Retrieved May 17, 2007. ^ Cosgrove-Mather, Bootie (April 26, 2002). "TV Guide Names Top 50 Shows". CBS News. Associated Press. Retrieved November 15, 2007. ^ "Seinfeld Cast and characters – Jerry". Sony pictures. Archived from the original on December 12, 2007. Retrieved December 11, 2007. ^ "Seinfeld Cast and characters – Elaine". Sony pictures. Archived from the original on December 17, 2007. Retrieved December 11, 2007. ^ "Seinfeld Cast and characters – Kramer". Sony pictures. Archived from the original on December 17, 2007. Retrieved December 11, 2007. 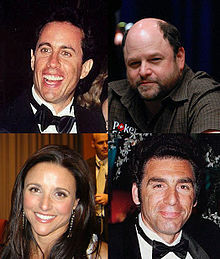 ^ "Seinfeld – Cast and Characters". Sonypictures.com. Archived from the original on January 27, 2012. Retrieved March 7, 2012. ^ "Seinfacts: The Revenge". Sony Pictures. Archived from the original on December 16, 2008. Retrieved December 30, 2008. ^ "The Strike". Sony Pictures. Archived from the original on December 16, 2008. Retrieved January 8, 2009. ^ "Seinfeld – Now Playing – The Chinese Restaurant". Sonypictures.com. Archived from the original on January 11, 2012. Retrieved September 18, 2011. ^ "The Betrayal". Sony Pictures. Archived from the original on December 16, 2008. Retrieved January 8, 2009. ^ "The Maestro". Sony Pictures. Archived from the original on December 16, 2008. Retrieved January 8, 2009. ^ "The Outing". Sony Pictures. Archived from the original on December 16, 2008. Retrieved January 8, 2009. ^ Erickson, Hal. "Seinfeld: Overview". Allmovie. Retrieved May 17, 2007. ^ Seinfeld, Jerry. "Jerry Seinfeld here. I will give you an answer". Reddit. Retrieved January 15, 2015. ^ Hurd, R. Wesley (June 1998). "Postmodernism: A New Model of Reality". 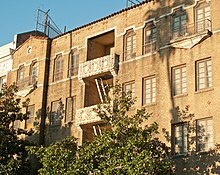 McKenzie Study Center. Retrieved June 30, 2007. ^ "All The Fictional Movies On 'Seinfeld,' Ranked". UPROXX. October 7, 2014. ^ Carter, Bill (November 21, 1994). "Seinfeld as Opening Act For Abbott and Costello". The New York Times. Retrieved January 19, 2018. ^ Caryn James (May 12, 1998). "Goodbye! Already". New York Times. Archived from the original on January 23, 2008. Retrieved December 22, 2007. ^ "Seinfeld influence". People.com. Archived from the original on January 26, 2008. Retrieved December 22, 2007. ^ "Seinfeld – Now Playing". Sonypictures.com. Archived from the original on May 16, 2013. Retrieved March 7, 2012. ^ "Seinfeld – Now Playing". Sonypictures.com. Archived from the original on October 10, 2012. Retrieved March 7, 2012. ^ "Seinfeld – Now Playing". Sonypictures.com. Archived from the original on January 19, 2012. Retrieved March 7, 2012. ^ "Seinfeld – Now Playing". Sonypictures.com. Archived from the original on October 9, 2012. Retrieved March 7, 2012. ^ "About Seinfeld". TV1. Archived from the original on August 31, 2007. Retrieved January 22, 2008. ^ Boudreaux, Jonathan (November 24, 2004). "Seinfeld: Season 1 & 2 DVD Review". tvdvdreviews.com. Archived from the original on April 18, 2008. Retrieved April 22, 2008. ^ a b c Littlefield, Warren (May 29, 2012). "QA: Former NBC honcho offered Jerry Seinfeld over $100 million for one more 'Seinfeld' season". Fox411 (Interview). Interviewed by Gostin, Nicki. Retrieved May 30, 2012. ^ Nigro, Nicholas (June 1, 2015). Seinfeld FAQ: Everything Left to Know About the Show About Nothing. Hal Leonard Corporation. ISBN 9781495035357. Retrieved December 29, 2015. ^ "Seinfeld – Now Playing – The Deal". Sonypictures.com. May 2, 1991. Archived from the original on October 10, 2012. Retrieved September 18, 2011. ^ "Seinfeld – Now Playing – The Parking Garage". Sonypictures.com. Archived from the original on November 16, 2011. Retrieved September 18, 2011. ^ "Seinfeld – Now Playing – The Keys". Sonypictures.com. Archived from the original on October 10, 2012. Retrieved September 18, 2011. ^ "Seinfeld -– Now Playing". Sonypictures.com. Archived from the original on November 14, 2012. Retrieved March 7, 2012. ^ "Seinfeld – Now Playing – The phone message". Sony pictures. Archived from the original on December 16, 2008. Retrieved October 27, 2008. ^ "Seinfeld – Now Playing". Sonypictures.com. Archived from the original on December 19, 2008. Retrieved August 22, 2010. ^ "Seinfeld – Now Playing". Sonypictures.com. Archived from the original on January 18, 2012. Retrieved March 7, 2012. ^ "Seinfeld – Now Playing". Sonypictures.com. Archived from the original on September 25, 2011. Retrieved March 7, 2012. ^ "Seinfeld – Now Playing". Sonypictures.com. Archived from the original on November 17, 2012. Retrieved March 7, 2012. ^ "Seinfeld – Now Playing". Sonypictures.com. Archived from the original on November 18, 2012. Retrieved March 7, 2012. ^ "Seinfeld – Now Playing – The Opposite". Sonypictures.com. Archived from the original on October 10, 2012. Retrieved September 18, 2011. ^ "Seinfeld – Now Playing". Sonypictures.com. Archived from the original on February 1, 2014. Retrieved January 28, 2014. ^ "Seinfeld – Now Playing – The Switch". Sonypictures.com. Archived from the original on May 16, 2013. Retrieved September 18, 2011. ^ "Seinfeld – Now Playing". Sonypictures.com. Archived from the original on November 17, 2011. Retrieved March 7, 2012. ^ "Seinfeld – Now Playing". Sony Pictures. Archived from the original on May 16, 2013. Retrieved March 7, 2012. ^ "Seinfeld – Now Playing – The Bizarro Jerry". Sonypictures.com. Archived from the original on January 17, 2012. Retrieved September 18, 2011. ^ "Seinfeld – Now Playing – The Little Kicks". Sonypictures.com. Archived from the original on October 10, 2012. Retrieved September 18, 2011. ^ "Seinfeld – Now Playing". Sonypictures.com. Archived from the original on December 19, 2011. Retrieved March 7, 2012. ^ "Seinfeld – Now Playing". Sonypictures.com. Archived from the original on November 30, 2012. Retrieved March 7, 2012. ^ "Seinfeld – Now Playing – The Muffin Tops". Sonypictures.com. Archived from the original on October 10, 2012. Retrieved September 18, 2011. ^ "Seinfeld – Now Playing – The Frogger". Sonypictures.com. Archived from the original on October 10, 2012. Retrieved September 18, 2011. ^ Bauder, David (December 26, 1997). "'Seinfeld' to end on 'peak' this spring". Google News. The Daily Courier. Retrieved September 28, 2016. ^ Nicki Gostin (May 29, 2012). "QA: Former NBC honcho offered Jerry Seinfeld over $100 million for one more 'Seinfeld' season". Fox News. Fox News Network LLC. Retrieved September 14, 2017. ^ "Seinfeld – Now Playing – The Puerto Rican Day". Sony pictures. Archived from the original on December 16, 2008. Retrieved October 25, 2008. ^ "Time Magazine Cover: Jerry Seinfeld". Time. January 12, 1998. Retrieved May 17, 2007. ^ "The 'Seinfeld' e-mail for April 8, 1998". CNN.com. April 8, 1998. Retrieved May 17, 2007. ^ Ryan, Joal (March 27, 1998). "Clues to "Seinfeld" Sign Off". E! News. Retrieved May 17, 2007. ^ Lowry, Brian (May 16, 1998). "'Seinfeld's' Finale Ends Up in Sixth Place of All Time". Los Angeles Times. ISSN 0458-3035. Retrieved April 28, 2015. ^ "Seinfeld's $267 Million Tops Celebrity-pay List In Forbes". Chicago Tribune. March 8, 1999. Retrieved September 9, 2011. ^ "The Highest Paid TV Actors Of All Time Per Per Episode". UPROXX. August 5, 2014. ^ Staff (December 26, 1997). "Seinfeld calls decision to end show "all about timing"". CNN. Retrieved December 18, 2007. ^ "Oprah and Seinfeld top TV's richest". Retrieved December 18, 2007. ^ "Seinfeld and advertising". Retrieved December 22, 2007. ^ Pilkington, Ed (June 7, 2010). "TV show Seinfeld earn $2.7bn from reruns". London: The Guardian. Retrieved June 7, 2010. ^ Craw, Victoria (February 8, 2017). "Steve Bannon is still making money from 'Seinfeld' reruns". The New York Post. Retrieved September 7, 2017. ^ Rob Reiner (November 23, 2004). Seinfeld Seasons 1 & 2: Inside Looks – "The Seinfeld Chronicles" (DVD). Sony Pictures Home Entertainment. ^ a b c d e Seinfeld Seasons 1 & 2: Notes about Nothing – "The Seinfeld Chronicles" (DVD). Sony Pictures Home Entertainment. November 23, 2004. ^ Duffy, Mike (November 24, 2004). "Give thanks for 'The 'Seinfeld' Story'". azcentral.com. Archived from the original on July 23, 2012. Retrieved March 19, 2008. ^ Rapp, David (May 31, 2006). "Seinfeld: The Unlikeliest Success Story". American Heritage. Archived from the original on March 15, 2008. Retrieved March 19, 2008. ^ Gillette, Britt (September 20, 2006). "Seinfeld (Seasons 1 & 2) DVD Review". Article City. Retrieved March 19, 2008. ^ "'Seinfeld' in HD on TBS HD! Page 2". videojanitor. Retrieved September 23, 2009. ^ "Seinfeld goes HD on TBS HD". AOL. September 3, 2008. Archived from the original on January 16, 2013. Retrieved October 28, 2009. ^ Magnotta, Elizabeth and Alexandra Strohl (November 14, 2011). "A linguistic analysis of humor: A look at Seinfeld". Working Papers of the Linguistics Circle. 21 (1): 126–135. Retrieved August 2, 2012. ^ "'Seinfeld' is a standup hit". USA Today. Gannett Company. June 6, 1990. p. D3. Retrieved December 30, 2013. 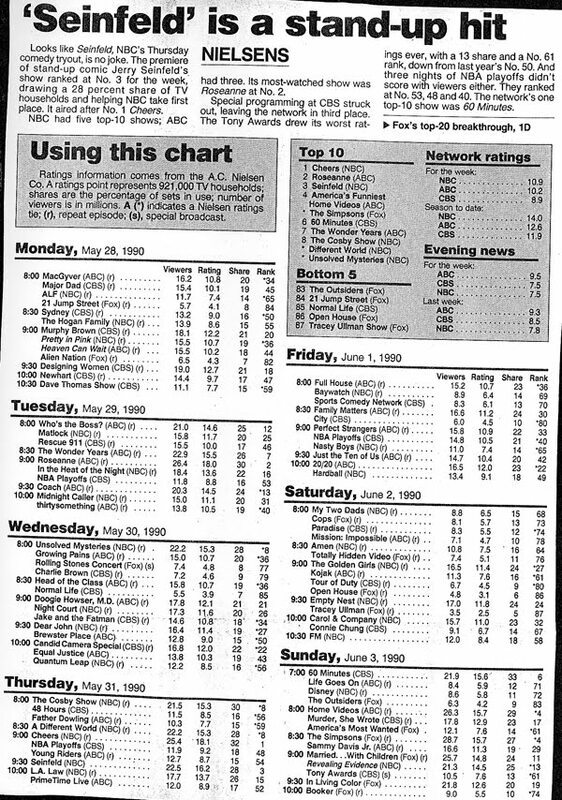 ^ "Nielsen ratings" (PDF). USA Today. Gannett Company. April 10, 1991. p. D3. Retrieved December 31, 2013. ^ "Nielsen ratings" (PDF). USA Today. Gannett Company. April 1, 1992. p. D3. Retrieved December 31, 2013. ^ Gable, Donna (May 26, 1993). "'Cheers' brings happy times to NBC" (PDF). USA Today. Gannett Company. p. D3. Retrieved December 31, 2013. ^ DeRosa, Robin (January 12, 1994). "'Improvement' leads ABC charge" (PDF). USA Today. Gannett Company. p. D3. Retrieved December 31, 2013. ^ "Nielsen ratings" (PDF). USA Today. Gannett Company. December 14, 1994. p. D3. Retrieved December 31, 2013. ^ "Nielsen ratings" (PDF). USA Today. Gannett Company. January 11, 1995. p. D3. Retrieved December 30, 2013. ^ Graham, Jefferson (September 27, 1995). "NBC Sunday starters stumble" (PDF). USA Today. Gannett Company. p. D3. Retrieved December 30, 2013. ^ "Nielsen ratings" (PDF). USA Today. Gannett Company. January 22, 1997. p. D3. Retrieved December 30, 2013. ^ "Nielsen ratings" (PDF). USA Today. Gannett Company. May 20, 1998. p. D3. Retrieved December 30, 2013. ^ "Nielsen ratings" (PDF). USA Today. Gannett Company. May 13, 1998. p. D3. Retrieved December 30, 2013. ^ Bootie Cosgrove-Mather (April 26, 2002). "TV Guide Names Top 50 Shows". CBS News. Retrieved October 18, 2010. ^ Staff (April 28, 2005). "A look at some of the biggest hits in movie and TV product placement". The Hollywood Reporter. Archived from the original on October 11, 2007. Retrieved November 10, 2007. ^ a b c d e f g h i "Seinfeld region 1 DVD release dates". TVShowsOnDVD.com. Archived from the original on April 5, 2008. Retrieved March 23, 2008. ^ "Season 1&2 (Region 2)". Amazon.co.uk. November 2004. Retrieved March 20, 2008. ^ "Season 1&2 (Region 4)". JB Hi-Fi Online. Retrieved March 21, 2008. ^ "Season 3 (Region 2)". Amazon.co.uk. November 2004. Retrieved March 20, 2008. ^ "Season 3 (Region 4)". JB Hi-Fi Online. Retrieved March 21, 2008. ^ "Season 4 (Region 2)". Amazon.co.uk. June 13, 2005. Retrieved March 20, 2008. ^ "Season 4 (Region 4)". JB Hi-Fi Online. Retrieved March 21, 2008. ^ "Season 5 (Region 2)". Amazon.co.uk. November 28, 2005. Retrieved March 20, 2008. ^ "Season 5 (Region 4)". JB Hi-Fi Online. Retrieved March 21, 2008. ^ "Season 6 (Region 2)". Amazon.co.uk. November 28, 2005. Retrieved March 20, 2008. ^ "Season 6 (Region 4)". JB Hi-Fi Online. Retrieved March 21, 2008. ^ "Season 7 (Region 2) review". dvdactive.com. Retrieved March 25, 2008. ^ "Season 7 (Region 4)". JB Hi-Fi Online. Retrieved March 21, 2008. ^ "Season 8 (Region 2) review". realmovienews.com. Archived from the original on March 2, 2008. Retrieved March 24, 2008. ^ "Season 8 (Region 4)". JB Hi-Fi Online. Retrieved March 21, 2008. ^ "Season 9 (Region 2) Review". dvdactive.com. Retrieved March 25, 2008. ^ "Season 9 (Region 4)". JB Hi-Fi Online. Retrieved March 21, 2008. ^ Jacob Kastrenakes (April 29, 2015). "Hulu confirms it's the exclusive streaming home of Seinfeld". The Verge. Vox Media. ^ Sam Byford (April 29, 2015). "Hulu reportedly lands streaming rights to all 180 Seinfeld episodes". The Verge. Vox Media. ^ "Stan. on Twitter". Twitter. Retrieved November 29, 2016. ^ "180 Seinfeld episodes come to Stan with new Sony Pictures Television deal". www.mediaweek.com.au. November 7, 2016. Retrieved November 29, 2016. ^ Axler, Rachel; Bleyer, Kevin; Blomquist, Richard; Bodow, Steve; Carvell, Tim; Havlan, J.R.; Scott Jacobson, Scott; Javerbaum, David; Karlin, Ben; Kutner, Rob; Lieb, Josh; Means, Sam; Reich, Jason; Ross, Jason; Stewart, Jon (November 1, 2007). "Episode dated 1 November 2007". The Daily Show. Comedy Central. ^ Seinfeld Season 9: Notes about Nothing – "The Finale" (DVD). Sony Pictures Home Entertainment. November 6, 2007. ^ "SNL Transcripts: Jerry Seinfeld: 10/02/99: Oz". October 8, 2018. ^ Baerg, Greg (March 5, 2002). "'Curb's' Larry David: 'Seinfeld' Curse 'Idiotic'". Zap2it. Retrieved May 17, 2007. ^ Hall, Sarah (August 27, 2006). "Emmys Clock into "24", "Office"". E! News. Retrieved May 17, 2007. ^ Rice, Lynette (March 5, 2009). "Exclusive: 'Seinfeld' cast to appear on 'Curb Your Enthusiasm'". EW.com. Retrieved March 5, 2009. ^ a b c d Carter, Bill (February 2, 2014). "Halftime Brings a Much-Anticipated 'Seinfeld' Reunion". Retrieved February 2, 2014. ^ "Seinfeld reunited! Jerry dines with George Costanza at Tom's Restaurant in Super Bowl ad that sees nemesis Newman show up". Daily Mail. February 3, 2014. Retrieved February 4, 2014. ^ Etkin, Jaimie (February 3, 2014). "Jerry Seinfeld Thinks That "Seinfeld" Super Bowl Reunion Is The Last One We'll See". Entertainment. BuzzFeed. Retrieved February 18, 2014.